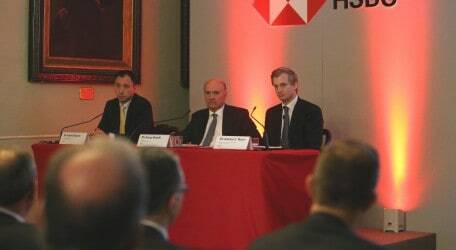 HSBC Bank Malta p.l.c. reported a profit before tax of €49.8m for the year ended 31 December 2017. This represents a decrease of €12.4m or 19.9% on the previous year. The bank confirms its business model and risk management change programme was substantially completed in 2017 leading to a short term reduction in profitability. HSBC has announced €20m extraordinary dividend to reward shareholders given the strong progress made with implementation of the bank’s strategic plan. The reported profit before tax incorporates three notable items which are excluded from the adjusted results as this is considered a better reflection of management’s performance. In 2016, the bank recognised the gain on disposal of the bank’s membership interest in Visa Europe amounting to €10.8m and raised a provision totalling €8m in relation to a remediation of the legacy operational failure in the bank’s brokerage business. During 2017, the remediation programme was largely completed and it was assessed that a partial reversal of the conservatively estimated provision was warranted. In this regard, a reversal of €1.8m was effected in 2017. During the year, the bank re-examined its approach to the provision for the collective agreement clauses related to future employee benefits. A longer-term view was assumed in the application of the current clauses which resulted in an additional charge of €7.6m in 2017 as compared with the charge of €2m in 2016. While the movements in this provision will periodically occur depending on the changes in the composition of the bank’s employee base, the provision adjustment in 2017 was not related to the business performance of the year. Profit attributable to shareholders amounted to €30.9m resulting in earnings per share of 8.6 cent compared with 11.2 cent in 2016. The Board recommended maintaining a current dividend payout ratio of 65% of net profit. The Board also made a decision to return part of retained earnings to the shareholders and recommended an extraordinary dividend of €20m in addition to the regular dividend paid out of the net profit for the year. The final gross dividend will be 12.4 cent per share (8.1 cent per share net of tax). Together with the interim dividend paid in September 2017, the total gross dividend for 2017 will be 17.1 cent per share (11.1 cent per share net of tax) or €61.6m (€40.2m net of tax) representing a 54.0% increase on the dividends paid for 2016. The final dividend will be paid on 19 April 2018 to shareholders who are on the bank’s register of shareholders at 13 March 2018. The year under review was characterised by broadly stable but persistently low interest rates and increasing excess liquidity in the market while attractive investment opportunities remained limited. In this environment, a record number of debt issuances by corporate entities was registered on the Malta Stock Exchange fuelled by investors’ demand for higher yield.